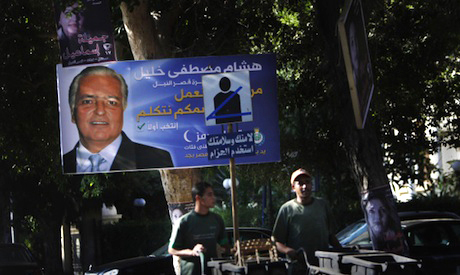 People's Representatives Coalition co-founder Hisham Moustafa Khalil (poster foreground) easily defeated his opponent in the 2010 People's Assembly elections, (Photo: Reuters). Former MPs from ousted president Hosni Mubarak's now-defunct National Democratic Party (NDP) intend to contest Egypt's upcoming legislative elections through a newly-formed coalition. Last month, former parliamentarians and other former NDP members established the People’s Representatives Coalition to run against Egypt's Islamist parties in the upcoming parliamentary race. Earlier this year, Egypt’s first post-revolution People’s Assembly – parliament’s lower house – was dissolved by a court order ruling it unconstitutional. Islamist parties had managed to win roughly two thirds of the assembly, with the Muslim Brotherhood’s Freedom and Justice Party (FJP) taking the lion’s share, followed by the Salafist Nour Party. Stigmatised as 'remnants' of the Mubarak regime, many former NDP members had been reluctant – due to their past affiliations – to run in the previous election. Instead, many contested the polls on the tickets of new 'NDP offshoot' parties, on the lists of non-NDP-affiliated parties, or as independent candidates. This, however, no longer appears to be the case. "We will contest 100 seats in the assembly at the very least," Mahmoud Nafadi, leading coalition member and spokesman, told Ahram Online. He went on to stress that some 75 per cent of the coalition's members were ex-NDP. The coalition is comprised of former parliamentary candidates and members, according to Nafadi, and purportedly aims to "defend the civil nature of the state" and "reclaim" the People’s Assembly from Islamist parties. "There are two families in Egypt: an Islamist one wearing Galabiyas [traditional Egyptian garments associated with the Islamist trend], and a civil one wearing business suits," Nafadi proclaimed. "We will introduce candidates with previous political experience who maintain strong relationships with their respective popular bases," he added, stressing that coalition members would run in all of Egypt's electoral districts. The coalition intends to coordinate with other parties and "civil" – as opposed to "religious" – political forces, and hopes to join a unified "civil" electoral bloc. The Egyptian Conference Party (ECP) is another umbrella group that also aims to preserve Egypt's "civil identity." An amalgamation of 25 political parties and movements, the ECP is led by former presidential candidate and Mubarak-era foreign minister Amr Moussa. The ECP is comprised of several associates of the former regime, along with a handful of NDP offshoot parties, including: the Egyptian Citizen Party, the Freedom Party, the Conservatives Party and the Democratic Generation Party. "Our hands are extended to people of honour, regardless of their previous partisan affiliations," ECP spokesman and Ghad Al-Thawra Party head Ayman Nour told Ahram Online. "We're open to dialogue with all of Egypt's political forces." Responding to questions as to whether the party was open to forming an alliance with the new People’s Representative Coalition, Nour said: "If these former MPs are honourable people, why not?" He added, however, that such an alliance had yet to be formed. Of the parties expected to rise to prominence in the non-Islamist camp is the newly-established Constitution Party, co-founded by prominent reform activist Mohamed ElBaradei. According to party spokesman (and former culture minister) Emad Abu-Ghazi, the Constitution Party is open to allying itself with any group that adopts "revolutionary principles." The Constitution Party is coordinating with other likeminded parties, Abu-Ghazi told Ahram Online, adding that no electoral alliances had yet been forged. He refused to give a definitive answer, however, regarding potential partnerships with the People’s Representatives Coalition. Notably, the coalition's stated aims do not mention anything about "revolutionary principles," which include social justice, human dignity and civil liberties. Egypt's current draft constitution represents a major source of political disagreement between Egypt's various political forces. Egypt's Muslim Brotherhood, meanwhile, is also reaching out to potential allies in the run-up to parliamentary elections. In October, head of the Brotherhood’s FJP, Saad El-Katatni, launched an initiative aimed at uniting with opposition parties and movements. "The FJP is aiming to forge an alliance with other political groups to achieve 50+1 per cent of the new People's Assembly," El-Katatni told Reuters. Nafadi, for his part, said his People’s Representatives Coalition had not been formally invited to join the FJP initiative (which he described as "too vague"), but that the coalition would nevertheless consider meeting with members of the Islamist party. Nafadi stressed, however, that his coalition would not engage "in any talks" with the Muslim Brotherhood until the latter issued a formal apology for allegedly attacking its political rivals at a Friday rally last month. FJP officials, meanwhile, say the People's Representatives Coalition "does not fit the criteria" laid down for the party's unity initiative. "Whoever took part in last year's revolution is invited to join this initiative," FJP spokesman Ahmed Sobei told Ahram Online. Having been closely associated with Mubarak's ruling party before – even during – the revolution, however, it appears unlikely that coalition members would be welcome in the FJP initiative. The People’s Representatives Coalition is comprised of 217 politicians, mostly hailing from Mubarak's now-defunct NDP. Its first public conference is set to take place in the Upper Egyptian Minya governorate in mid-November.